Overall smartphone battery life may be declining due to the increasing demands new technologies place on lithium ion batteries, according to smartphone testing done by The Washington Post. In a series of battery life tests where multiple smartphone models from the past few years were set at the same brightness and forced to reload the same sites, newer smartphones were not able to last as long as older devices. When it comes to the iPhone, for example, the iPhone XS died an average of 21 minutes earlier than the previous-generation iPhone X. Battery life impact was most noticeable with the Google Pixel 3, which lasted an hour and a half less than the Pixel 2. According to The Washington Post, the iPhone XR, which uses an LCD instead of an OLED display, was a notable exception, performing well on the battery life tests. The iPhone XR boasts the longest battery life of any iPhone with 25 hours of talk time, 15 hours of internet use, 16 hours of video playback, and 65 hours of audio playback. It lasted the longest in the battery test, besting the Pixel 3XL, the Samsung Galaxy Note 9, and the iPhone XS Max. Nadim Maluf, CEO of battery optimization firm Qnovo, told The Washington Post that batteries improve at about "5 percent per year" but smartphone power consumption is growing faster than that. The Washington Post consulted with other tech sites like Tom's Guide and CNET, and came to the conclusion that high-resolution OLED displays and cellular connectivity are major factors that impact battery life. Turning down display brightness and using WiFi when possible, two well-known techniques for preserving battery life, are among the site's recommendations for eking more juice out of a smartphone. 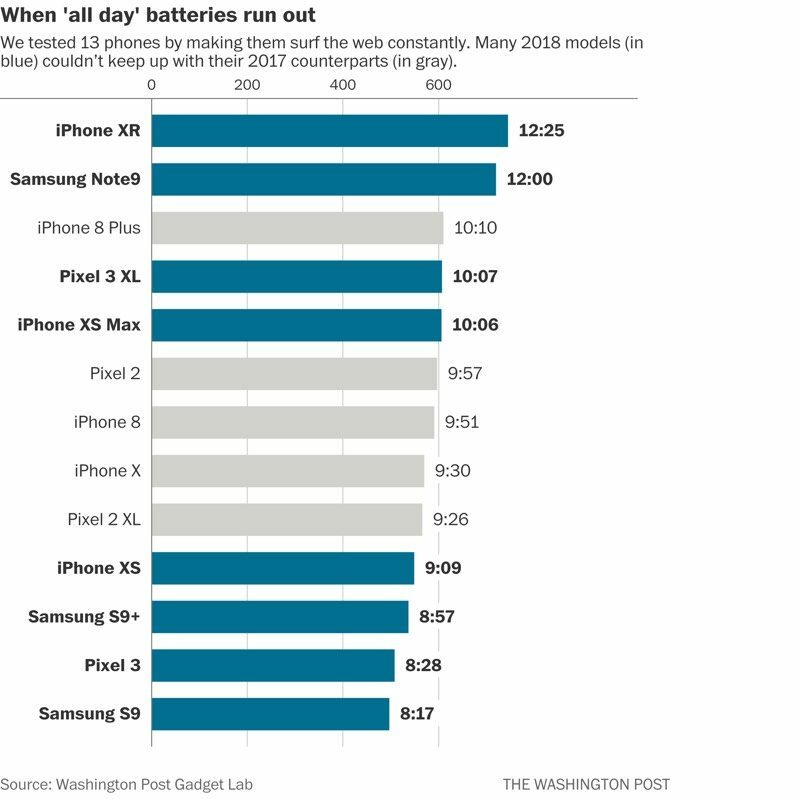 The Washington Post's battery life test focused on the display, but other battery life tests, such as one conducted by Consumer Reports using a machine that opens up apps, had different results, with the iPhone XS beating the iPhone X due to improvements Apple has made with the processor. Variations in battery life due to different tests and different real-life usage situations can make it difficult to tell whether overall battery life is increasing or decreasing over time, says the site. Battery company Onavo's CEO believes that consumers should "start getting ready for compromise," settling for smartphones with increasingly bigger batteries that result in larger, heavier devices or lesser technologies like the LCD display in the iPhone XR. If companies weren't obsessed with making everything as thin as possible, this wouldn't be an issue. There really is a very easy fix, the article even covered it. Just make the phone thicker. There, problem solved. There's no benefit to having a phone as thin as current iPhones anyway. Or just put a bigger, I mean BIGGER battery! First, the LCD screen in the XR is better than any LCD screen shipped by Apple in prior iPhones. Second, the battery life issue is solved for iPhones for regular users. If you use your phone for about 1 to 2 hours per day of screen time, you won't possibly run it out during the course of the day. If you are using more than that, well, then it is because you really get a ton of use out of your phone. That isn't a compromise, that is someone who bought a phone that is just turning out great for them. It is like complaining that you love to drive your sports car but hate that it uses more gas the more you drive it. Maybe stop offsetting every efficiency gain with a smaller battery. Problem solved. Wait, I thought OLED was supposed to save power versus LCD? I remember back in 2015 there was a rumor about company making hydrogen fuel cells that could fit inside of iPhones and provide a week of charge ('https://www.macrumors.com/2015/08/24/hydrogen-fuel-cell-phone/'). One drawback was that it required a small vent for water vapor exhaust. Apple went from 9.3 mm (iPhone 4) to 7.7 mm (iPhone Xs). That's a lot of anode and cathode layers that could be used for battery capacity. Its not about thickness, it is weight that is the issue with a bigger battery. Too heavy to hold. The X is already too heavy. Get a crappier phone to get improved battery life. Brilliant. Time for us all to go to flip phones single-color displays and we'll get a couple weeks of battery life.